The sculpture of the “Apostle to the Apostles” was installed last year in front of the church on Manchester Road at Brentwood Boulevard. The design is taken from the crucifixion scene in the church. A St. Louis artist, Abraham Mohler, sculpted it from a block of limestone. The 10,000-pound statue honors the power of Christ working through St. Mary Magdalen. 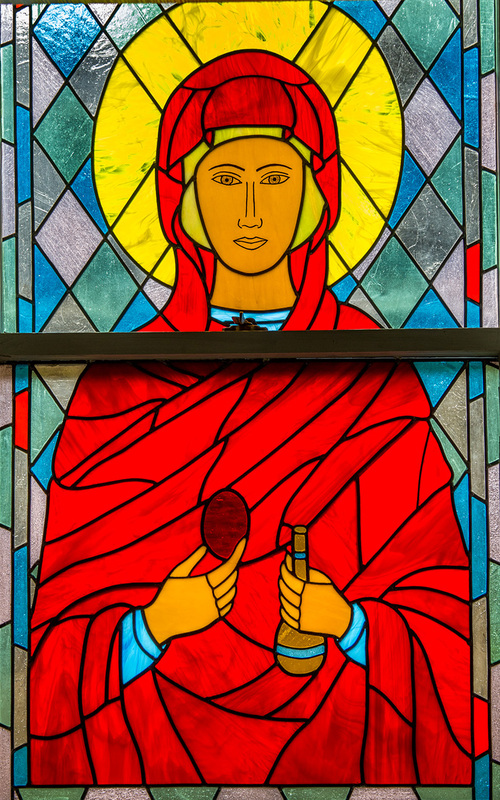 St. Mary Magdalen Parish in Brentwood installed a portrait of St. Mary Magdalen, part of an effort to educate people on the parish namesake — the “Apostle to the Apostles.” Chris Musial, the parish’s Boy Scout troop master, conceived the project and created and inserted the stained glass into old window frames in the lower level of the church. Sun shines through the three stained-glass windows in a renovated gathering room at St. Mary Magdalen Parish in Brentwood, beckoning further examination. The windows are at the front of the room, behind a small stage. In the center is a portrait of St. Mary Magdalen, part of an effort to educate people on the parish namesake — the “Apostle to the Apostles” and devoted follower who was the first witness recorded in Scripture to the risen Christ and the messenger who announced the Lord’s resurrection to the apostles. The main window — framed by two stained-glass windows designed with the crests found behind the altar in the church — is a reproduction of a traditional icon of the saint, the same image on a tapestry hanging in the parish school. The church also includes a painting of a crucifixion scene that depicts St. Mary Magdalen at Calvary. A recently commissioned stone statue of the saint on the front lawn outside the church displays the love the parish has for its patroness. The center window took about four months to complete, said Musial, the parish’s Boy Scout troop master who conceived the project and created and inserted the stained glass into old window frames with help from his family and others. The windows were required to remain in the construction as an outlet to a fire-escape exit. Before the renovation, wooden panels covered the windows. Father Siefert said the windows sorely needed an upgrade, and he quickly agreed to Musial’s offer to put his hobby of stained-glass making to use. Musial drew upon his wife Mariann’s design skills for the saint’s face, and his sons Joey and Matt lent their abilities. A few friends helped cut glass, and even Father Siefert added his handiwork. Mariann designed a darker-skinned Aramaic woman, unlike other portraits of St. Mary Magdalen. The window showcases colors, especially red and yellow, but also presents a minimalist style. The sculpture of the “Apostle to the Apostles,” funded through donations, was installed last year in front of the church on Manchester Road and Brentwood Boulevard. The design is taken from the crucifixion scene in the church. A St. Louis artist, Abraham Mohler, sculpted it from a block of limestone. The 10,000-pound statue honors the power of Christ working through St. Mary Magdalen. Mohler said he was honored and blessed to have the opportunity to create the piece and learn more about the saint. “To depict her in that moment of anguish and confusion (at the crucifixion) but yet still portray that thin ray of hope was what I was striving for. I was pleased with how her face turned out. It seemed to come about pretty effortlessly,” he said. St. Mary Magdalen is an example of a true and authentic evangelizer, one who announces the central joyful message of Easter. In the Gospel of St. Luke, St. Mary Magdalen is mentioned among the women who accompanied Christ and ministered to Him (Luke 8:2-3). She is one of Jesus’ most celebrated disciples, famous, according to Mark 16:9-10 and John 20:14-17, for being the first person recorded in Scripture to see the resurrected Christ.